The art of finding a new job is a risk both parties involved are taking. On one side, the company hiring is taking a bet on the new selected candidate, the person can be a good fit but sometimes it might also end up not being the right person to do the required job. But what people usually forget, especially the aspiring candidate, is that accepting a new job offer represents a jump in the air too. The truth is, you are taking a risk at accepting to work for and with someone you don’t really know. And again, your boss can turn out to be a great person, sometimes even a really good friend, (which is awesome), but there are also cases where people end up having to deal with me meanest person ever met, every day, all the time… because, it’s their boss. So as a candidate, it’s your job too to scout the person that will become your boss. Read the signs and try to foresee if he/she actually shows himself to be a good person that you see yourself working with or, if it’s actually an ogre disguised as a sheep. 1. They’re late for the job interview. 2. Their office is unusually disorganized. 3. They ask illegal questions during your interview. Does the hiring manager ask questions about how many children you have or if you plan on having any? Do he/she ask about your religion or your age? Hiring managers should always avoid asking any questions based on race, religion, gender, age, national origin, marital status, sexual orientation, gender expression or identity, veteran or military status, and physical, mental, or sensory disabilities. That’s because these are all “protected classes” under most state law. If you’re asked any of these types of questions, it means the hiring manager either isn’t trained and experienced or may be unethical. 4. Other employees avoid the hiring manager. As you walk down the hallway to the hiring manager’s office or conference room for your interview, be aware of how other employees react to the manager. Are they friendly and positive toward him/her? Or, do they quickly turn around and walk away or dive behind cubicles to avoid being seen? 5. They don’t focus on the job interview. The goal of a hiring manager should be to hire the best possible candidate for the job. That means being 100% focused on the candidate and interview. Look for red flags, such as: checking email, answering telephone calls, texting, and speaking with other employees during your interview. Avoid accepting a job for a boss who doesn’t give you his or her full attention during your job interview. 6. They don’t ask difficult questions. To find the best candidate takes a lot of digging and questioning. So be wary of the hiring manager if he/she isn’t asking you tough questions about your knowledge, skills, and experience. 7. They keep changing the topic of conversation to talk about themselves. 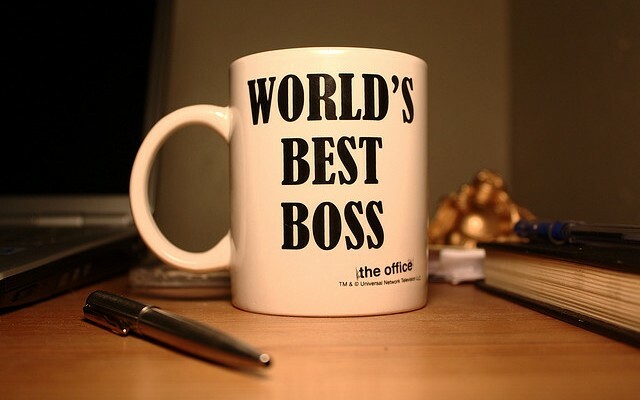 There is almost nothing worse than working for a narcissistic boss. These are managers who have an excessive sense of self-importance and are extremely preoccupied with talking about themselves. These are also the bosses most likely to steal your ideas, take credit for your work, and who often have deep-rooted insecurities. 8. They display anger management issues. Don’t put yourself in the position of working for a verbally (or physically) abusive boss. Signs to watch for are: yelling at his/her assistant or other employees, slamming doors, throwing things, saying negative things about others, going from calm to angry in a split second, tension you can visibly see (clenched fists, furrowed eyebrows, sweaty forehead, fast breathing), and over-reacting to things you say during the interview. 9. They can’t clearly communicate what it will take for you to be successful in the position. The hiring manager should know what it takes to be successful in every job within their department. This includes the knowledge, skills, background, education, and attitude necessary. If they don’t know this, why are they the department manager? 10. They don’t have a clear vision with goals and objectives for their department. Same here. If the hiring manager can’t clearly articulate the vision, goals, and objectives for their department, then they shouldn’t be in that role. This isn’t the kind of manager you want as your leader.